When your back, neck, or shoulders hurt, you want relief from the pain. It can be scary visiting a practitioner when you have never been before and there are a lot of common misunderstandings or misconceptions about the world of computerized treatment. You would visit a dentist if you had a toothache, right? So why not visit a practitioner where you can receive treatment from a specialist who knows best how to provide relief from your pain. For those who have not visited a practitioner, we want to provide you with common frequently asked questions to give you more information on our practice. Computerized treatment is known as being a drug-free and non-invasive treatment for skeletal pains. Some patients will need multiple treatments in order to feel the benefit of computerized treatments; others may feel soreness, stiffness, or aching after treatment. Whether you are experiencing lower back pain, neck pain, or issues with your sciatica, a visit to the practitioner can safely provide relief. If you struggle with frequent headaches, a neck adjustment may be the answer because it improves the mobility and range of motion in the neck. When consulting with a practitioner, be as specific as possible about what symptoms you are feeling in order for the doctor to provide you with the best treatment options. 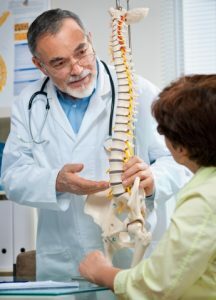 When working with an experienced and well-trained practitioner from Divine Spine, computerized treatment is safe. Does Computerized Treatment Need a Referral? Most practices do not require a referral from an MD. However, it does depend on your specific health plan and its requirements. Contact your insurance plan directly to determine what is needed. Generally, patients are able to call a practitioner and schedule an appointment. Are Computerized Treatments Safe for Children? Yes they are! Each treatment is tailored for every patient. When children visit a practitioner, the treatments are gentle and safe. For children who are especially active in sports or hobbies, injuries from falls or daily activities can benefit from computerized treatment. Do Practitioners Work in Hospitals? Yes, they do. Practitioners are able to see and treat patients in hospitals as well as have access to their labs and x-ray machines. A practitioner will use computerized treatments to manipulate the joints of the body, especially the spine. Sometimes special instruments are used to assist the practitioner in enhancing joint function. An adjustment is a controlled procedure and most patients do not feel pain or discomfort. There is often a popping sound during the procedure; this is a gas bubble being released between the joints. Back pain, neck pain, frequent headaches, sciatica problems can all be resolved through non-invasive computerized treatments. Often, medication is that prescribed for these conditions have negative side effects. Improve your health and wellness by giving a wellness treatment a try. New doctors can be intimidating, but at Divine Spine, we are here to provide you relief from your pain. You can be confident in our wellness care.